2 Bedroom Semi Detached Bungalow For Sale in Liverpool for Offers Over £190,000. Entwistle Green are presenting the opportunity to purchase this attractive bungalow with no ongoing chain! This well-presented property, situated in a quiet cul-de-sac location comprises in brief: entrance vestibule, lounge, kitchen, inner hallway with two bedrooms and a family bathroom. 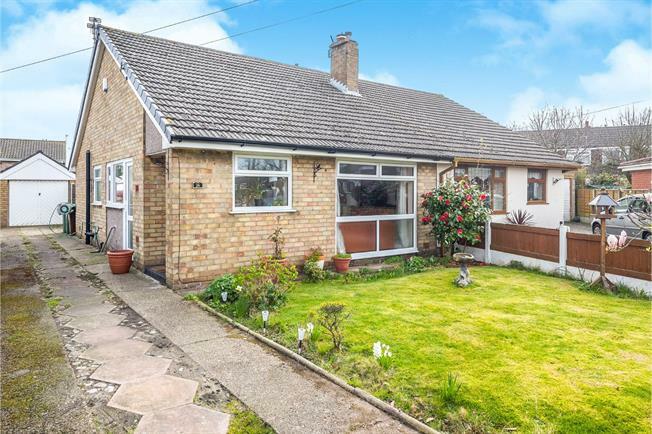 Further benefits include a driveway and garden to front, detached garage and sunny rear garden. Double glazed uPVC entrance door. Electric fire with surround. Double glazed uPVC window. Radiator. Fitted wall and base units with complementary work surfaces. Stainless steel sink and drainer with mixer tap. Housing for fridge/freezer, cooker and plumbing and housing for washing machine. Double glazed uPVC window and door. Fitted wardrobes. Double glazed French doors. Radiator. Panelled bath with shower over. Low level wc. Wash basin. Heated towel rail. Tiled walls and flooring. Double glazed uPVC window. Driveway and garden to front with laid lawn. Detached garage. Rear enclosed garden mostly laid to lawn with sunny aspect.